The collection application allows users in the field to collect survey data quickly and reliably, making use of the advanced features of the device like the camera and GPS receiver. The devices communicate with the central server to automatically download assigned surveys and upload data as it is collected. If the device does not have a data signal, it will store the data locally until it reestablishes communication with the server (either over the cellular network or WiFi). The collection application is an Android application that runs on any mobile device using running Android 1.6 or greater. Any number of surveys can be installed on a device at a given time. Users can chose which survey to use from the home screen. Devices allow for switching between languages (provided the survey was defined to support that language). Numeric - ensure a field only contains numbers. This validation rule can also support ensuring numbers are non-negative, checking for whole numbers, and ensuring values are within a particular min/max range. To eliminate the need for survey takers to decide which questions are applicable, the set of displayed questions will change based on the responses entered. Question dependencies are set up during survey creation. The Region Plotting function is a GPS-powered function that allows a user to capture the outline of a geographic region by simply walking around it. The device can be configured to auto-capture way points or to wait for users to manually mark a way point via a button press. Upon completion of a "plot", this data is automatically uploaded to the server for processing. When entering the "Nearby Items" view, the system will communicate with the server to look up any "tasks" tagged with a geographic location close to the current device position. 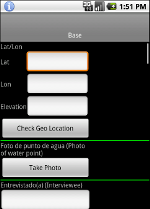 Users can then view a task and optionally enter notes or mark it completed. 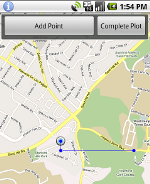 This feature could be used for assigning work to people in the field based on who is nearby.